BALL Of Muscle is in career-best form, he has scored stakes wins at both starts this spring, and he just defeated three horses who are confirmed starters for the $13 million The TAB Everest. So, it was understandable trainer Joe Pride was making a case for his eight-year-old to be considered for the final slot in the elite 12-horse Everest field. Pride's evergreen sprinter Ball Of Muscle is making a late bid to gain a start in the world's richest turf race by defying Everest hopefuls Invincible Star (second), Brave Smash (third) and English (sixth) to take out the Group 2 $200,000 The Shorts (1100m) at Royal Randwick on Saturday. 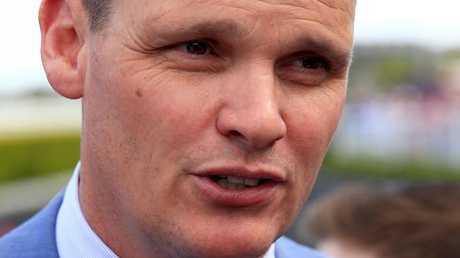 The trainer admitted there hasn't been any interest in Ball Of Muscle, but with his sprinter continuing to win it might change the thinking of slot-holders Max Whitby and Neil Werrett, who are still to determine their sprinter for the world's richest turf race. "Ball Of Muscle might be an eight-year-old but he has been lightly raced, he has never been going better and it would be great if he could get a start in The Everest,'' Pride said. "Some of these other horses may or may not have performed at Randwick, but this horse is extremely consistent. He's very fast and will give a sight." Jockey Glyn Schofield then chimed in: "He's beaten Everest horses in his last two starts." Ball Of Muscle ($5) led throughout and held off the late surge of Invincible Star ($2.70 favourite) to win by a half-head with Brave Smash ($4.40) less than a length away third. The Kosciuszko hopefuls After All That and The Monstar ran fourth fifth respectively with English tiring late for sixth. 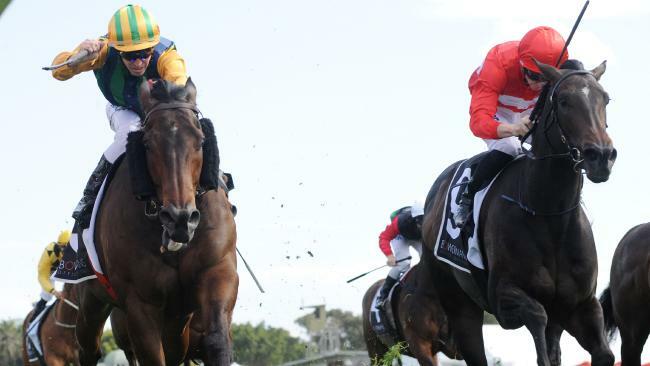 Redzel, the defending Everest champion, was withdrawn from The Shorts on Saturday morning after he was found to have some muscle soreness. Ball Of Muscle finally won The Shorts after finishing second the three previous years. He also emulated his half-brother Terravista, who won this race in 2014. "It's funny to see an eight-year-old in what looks to be career-best form but it would be hard to argue with that,'' Pride said. "He's a horse who makes his own luck while other horses, you could make the case for the filly (Invincible Star) to be unlucky but he puts himself in the spot. He's a very fast horse and most effective at Randwick. "He was breaking 11s (every 200m sectional) and he was really strong late in the race. I was really proud of the performance and he will improve a bit more for his next couple of starts. "Schofield praised Pride's training effort with the likes of Ball Of Muscle. 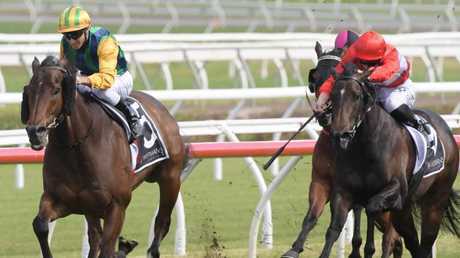 "The 'bread and butter' horses that Joe picks up, he just keeps winning good races with them,'' Schofield said. "Joe flies under the radar a lot of the time but he has certainly produced this horse for a peak performance. "It's nice that after he has run second in this race three times in a row and he has eventually won it. "He just comes out really quick, he's flat out the word go. I was lucky that I could gather him mid-race and while he wants to high roll out in front I was able to hold onto him for 100m or so around the side and he just found enough late." James McDonald, rider of Invincible Star, said the mare is on target for The Everest after she bungled the start and still ran a close second. "I was very happy with that, she was unlucky not to win,'' McDonald said. Hugh Bowman, rider of Brave Smash described his sprinter's effort as "superb'' with the Darren Weir-trained six-year-old going into The Everest in better form this year than last when he ran third to Redzel. English loomed up for a few strides in the straight but couldn't sustain her sprint. "She just blew out late,'' said jockey Tim Clark. "A few of the other horses had had a run so she will improve a lot. "It wasn't ideal losing the plate at the gates and she pulled a bit of foot off as well but getting to the Everest she will be all right."